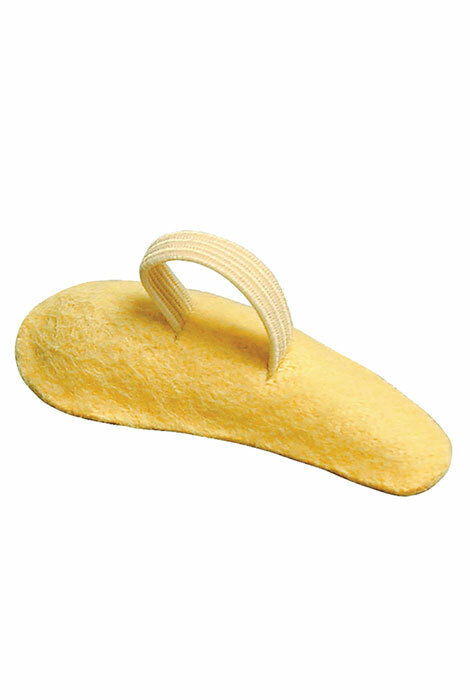 Felt hammer toe crests support your toes from underneath to remedy a variety of foot problems. As the ergonomic shape reduces pressure on toe tips and stress on the metatarsal shafts, it can help ease forefoot pain. As it gently stretches and lengthens foot muscles, this toe support helps relieve hammer, mallet, claw and arthritic toes, as well as helps prevent corns, calluses and blisters. Adjustable elastic toe loop provides a custom fit and helps keep cushion in place without adhesives. Toe protector's durable felt construction holds its shape better and longer than some silicone supports. Sold individually. Choose right or left in 3 sizes for a custom fit. Hand wash; dry flat. Adjustable elastic toe loop provides a custom fit and helps keep cushion in place without adhesives. Durable felt construction holds its shape better and longer than some silicone supports. Small (women's shoe size 4-7), Medium (women's 8-10​, men's 6-8), Large (women's 11+, men's 9-10). This is a life saver for my feet !! Until I found this pad to lift my toes slightly, I was in such pain and agony when I walked a distance. My podiatrist suggested I look into getting some kind of lift for under my toes , What a "find" it was when I saw exactly that product in your recent catalogue, and priced so that I could afford it. Once again, Walter Drake comes through for me !! Due to foot surgery I have hammertoe and atrophy in little toe. Hope this helps relieve some of the pain when walking.